Adria Airways is the national airline carrier of Slovenia. Started in 1961 by parent company, Adria Airways is an airline based in Ljubljana, Slovenia, Europe and controls a passenger fleet size of 14. Adria Airways operates scheduled flight services to over 25 destination cities across Europe and the Middle East. The airline operates its services from its main hub which is located at Ljubljana Jože Pucnik Airport. Adria Airways controls a 14 passenger aircraft fleet which consists of the following aircraft model types :- Airbus A320-231, Boeing 737-500, Bombardier CRJ-200 LR, Bombardier CRJ-900 and Bombardier CRJ-1000. Adria Airways has a frequent flyer program known as Miles & More where members can earn and accumulate miles while flying on Adria Airways flights. The member lounge for Adria Airways is known as Senator Lounge. 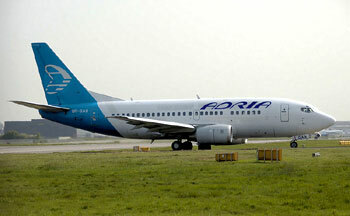 Adria Airways flies to cities across Europe and Middle East. The list below are the cities operated by the airline company.